If there is anything Konami is especially good at (besides designing some amazing game titles,) it's teasing the loyal Metal Gear Solid fans. The latest tease involved a countdown clock, some mysterious written characters, and a trailer potentially showing co-op for the first time. Metal Gear Solid Peace Walker has captivated our attention, and we take a close look at a few passages from a Konami interview that allude to potential co-op. Metal Gear Solid: Peace Walker is the spiritual, if not direct, successor to Metal Gear Solid 3. 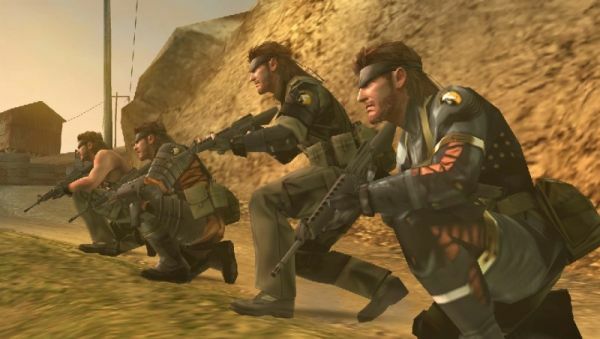 Players will control Naked Snake once more, with more metal gears on the horizon. Peace Walker takes place in 1974, with a whole new game design and original Hideo Kojima story made to fit the PSP. The passage that stood out to us, was one that asks of Co-op in the trailer released at E3. "I understand that it is a tactical espionage action game but could you provide some explanation for bringing this title to the PSP platform? I saw 4 Snakes in the trailer presented at E3, is this COOP?" "The game will be stealth-action based. I can't reveal too many details yet, but we are implementing features that can only be realized on the PSP platform that I believe everyone can look forward to. The game will be a little different from the METAL GEAR that players have come to know. However, the story can be replayed numerous times and the game is full of challenges to complete, so I feel that this title will really satisfy players with its long-lasting play time. Just as an example, do you recall the cardboard box at the end of the Peace Walker trailer? In addition to that two-man box, we are preparing a variety of other different cardboard boxes this time around. To give a little more insight into the game, you can, how shall I say... customize Snake according to your preferences and determine what kind of soldier you will use prior to embarking on your mission. For example there's heavy gear configurations that make a lot of noise, but that allow you to equip numerous weapons. Or, there are other configurations that won't allow you to carry many weapons, but will allow you to be light on your feet. We will be preparing a variety of other types as well. Being able to make decisions and plot a strategy will be one of the really enjoyable features of this title. We are also working on a "growth feature" as well, where your character evolves. It will be a new type of system, so I hope everyone will look forward to it!" What does this cryptic passage mean to you? Without a definite yes, or no, co-op is still a possibility! Page created in 0.6078 seconds.